A CONCEPTUAL DRAWING of the SteelCraft Garden Grove project planned for a 2018 opening on Euclid Street in downtown (StudioOneEleven). While the planning and design of a cutting-edge urban eatery and retail complex in downtown Garden Grove goes on in offices in Long Beach, groundwork of a different kind was being laid Monday night at a meeting room in the Big Strawberry’s Community Meeting Center. Representatives of SteelCraft LP, the firm that will be assembling and managing a 14-unit project on Euclid Street on the site of the former Black Angus restaurant, met with a group of about two dozen residents and others interested in the unique development. 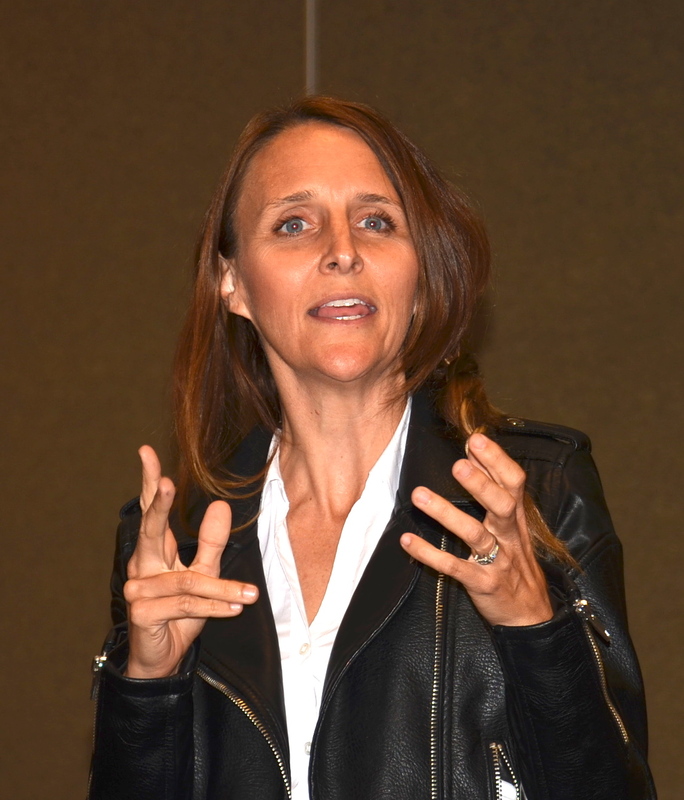 KIM GROS, founder of SteelCraft (OC Tribune photo). 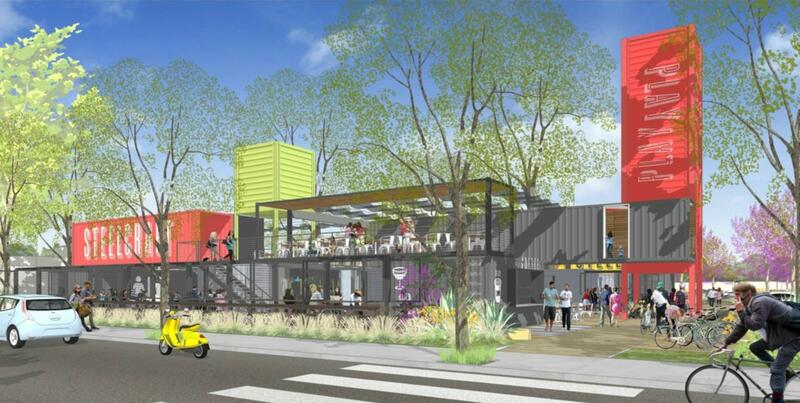 SteelCraft founder Kim Gros led off with an account of how she brought the idea of using repurposed steel shipping containers into a project which would “bring a lot of energy and good food” to her community in the Bixby Knolls area. She later added that she didn’t intend to offer competition to nearby Main Street businesses, but to complement the existing downtown area. Jennifer Le, marketing director for Howard CDM, which will construct the project, expressed her appreciation for the town in which she grew up. “I love the city of Garden Grove,” she said, “I’m loyal to the city of Garden Grove.” She attended local schools and was graduated from Rancho Alamitos High School, where she was a cheerleader. 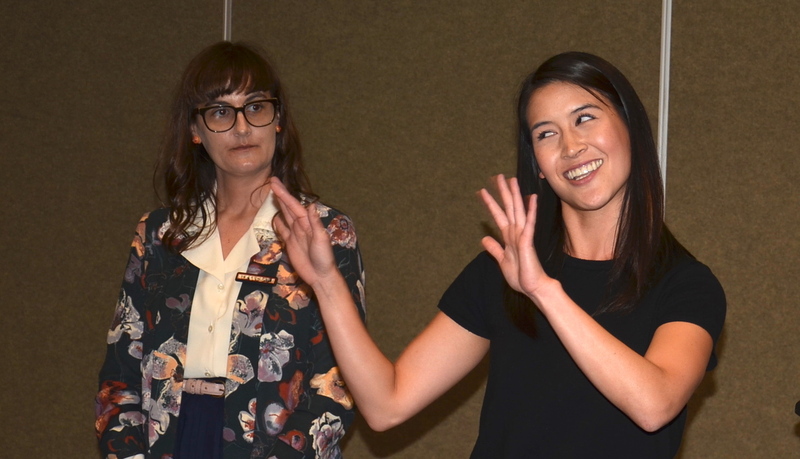 KRISTINE LOPSHIRE (left) and Jennifer Le (OC Tribune photo). seating area on the second floor, offering a view of the downtown-civic center area. there are 189 vendors seeking to locate in the Garden Grove project. The original Steelcraft project on Long Beach Boulevard in Long Beach has 10 vendors. It includes an Italian restaurant, a waffle eatery, a brewery-bar, a shaved-ice shop and others. A third project was approved last week for Bellflower. After the presentations, attendees were invited to speak with the presenters and offer suggestions on what kind of businesses they’d like to see in the SteelCraft Garden Grove project, scheduled for completion in summer of 2018.